Download "PROGRAMME SPECIFICATION KEY FACTS"
3 collaboratively and across professional boundaries. 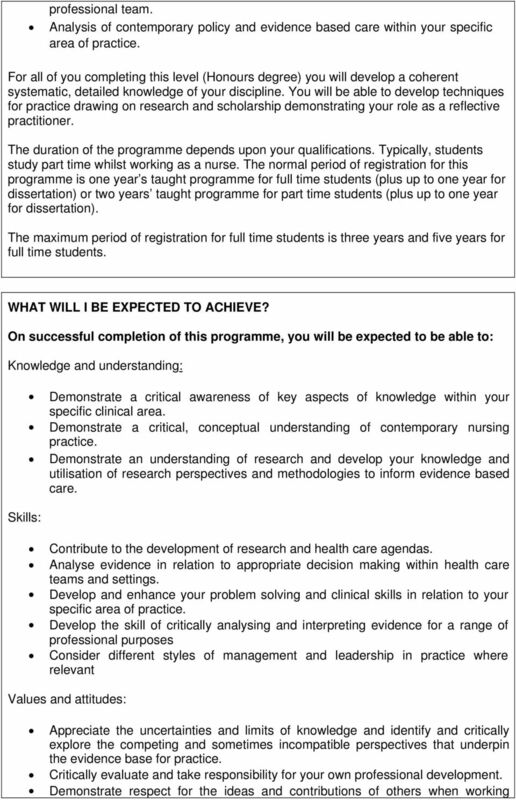 This programme has been developed in accordance with the QAA Subject Benchmark for Nursing. Further information can be found via the following link: Registration Period The normal period of registration for this programme is one year s taught programme for full time students (plus up to one year for dissertation) or two years taught programme for part time students (plus up to one year for dissertation). The maximum period of registration for full time students is three years and five years for full time students. HOW DO I ENTER THE PROGRAMME? You must be registered in the United Kingdom as a nurse. 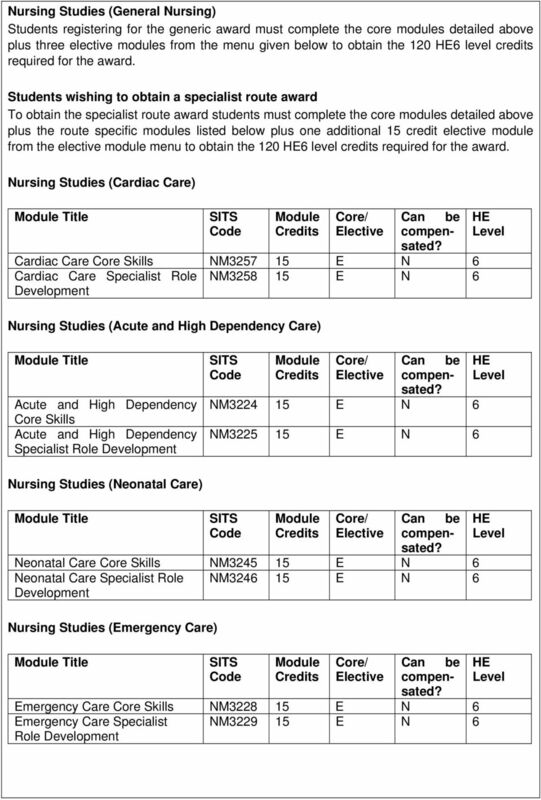 You should have 120 HE 4 credits and 120 HE 5 credits; you should have attained these as part of a Dip-HE in Nursing programme which included registration with the NMC. If you do not have sufficient HE5 credits see the APL/AP(E)L Requirements below. If you would like to apply for one of the specialist routes you should have approximately 10 months experience working as a nurse in your chosen specialist care environment and you must have continuing access to patients / service users in your chosen specialist area. If you wish to undertake a specialist route you must also have clinical support. 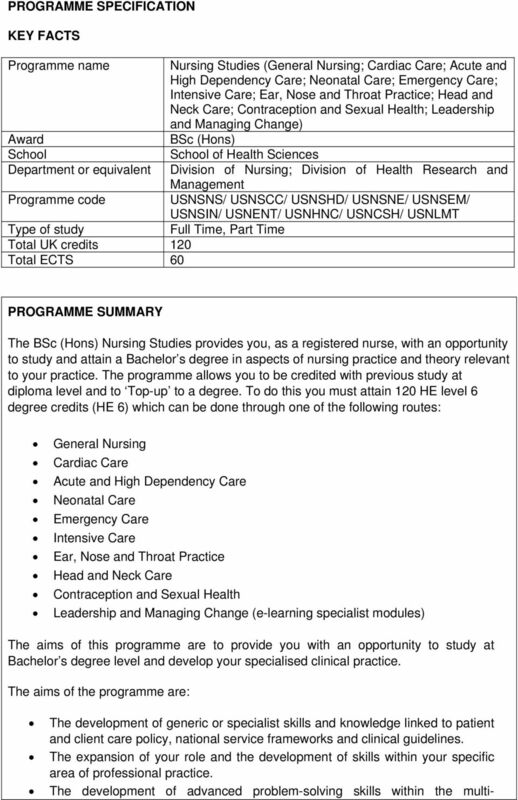 Students wishing to rescind their Diploma in Higher Education Nursing Studies must register for the BSc (Hons) Nursing Studies within five years of graduating. If English is not your first language you will be required to supply evidence that your command of the language is suitable for undergraduate studies. This will be through one of the following: British Council IELTS Test Overall score of 7.0 Test of English as a Foreign Language (TOEFL) minimum score accepted by City: Undergraduate = 107 (internet based test). 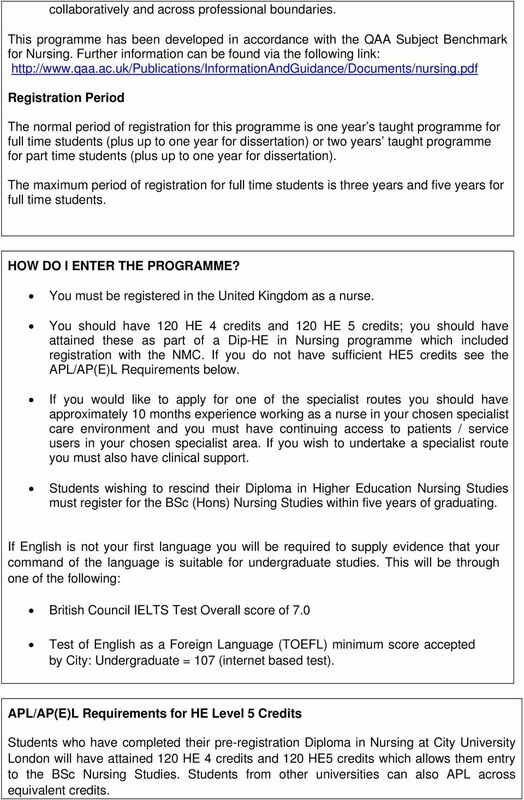 APL/AP(E)L Requirements for HE 5 Credits Students who have completed their pre-registration Diploma in Nursing at City University London will have attained 120 HE 4 credits and 120 HE5 credits which allows them entry to the BSc Nursing Studies. Students from other universities can also APL across equivalent credits. 4 Students who have not achieved 120 level HE5 credits must enrol on the module CH2083 Accreditation of Prior Experiential Learning as an alternative portfolio entry route. A fee is applied for any external student bringing in credits from another Higher Education Institution. 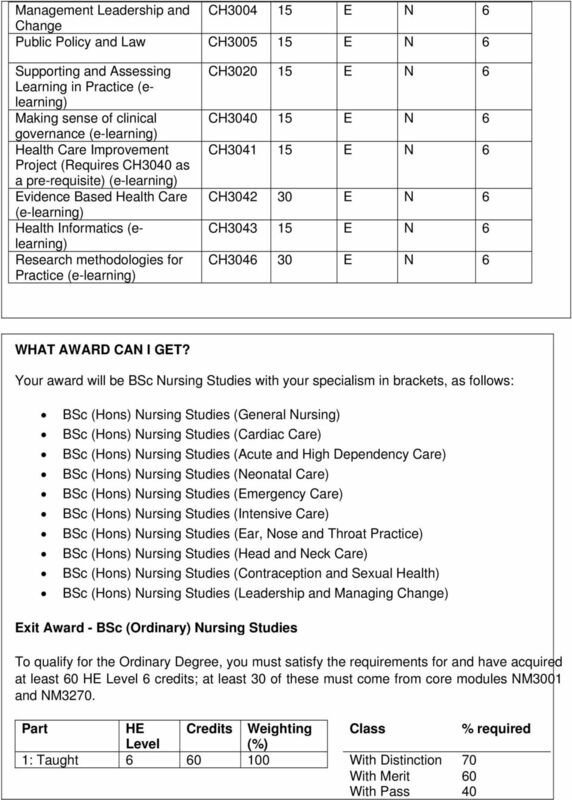 APL Requirements for HE 6 Credits Students who have obtained relevant level HE6 credits through CPPD study in the five years before registering on the programme can use APL to transfer these credits towards the award of BSc (Hons) Nursing Studies. Students who have undertaken the preregistration Diploma in Nursing at City University London will have obtained 45 or 60 credits at HE level 6 during their third year. They are able to APL these credits into the BSc Nursing Studies. 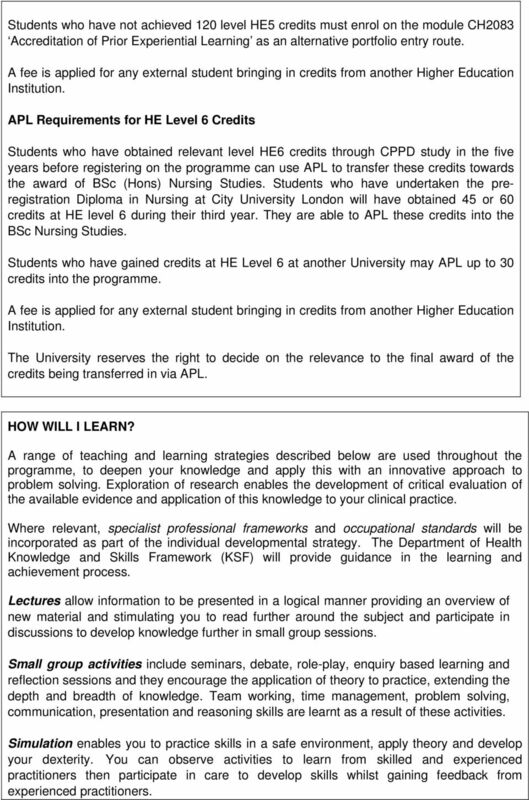 Students who have gained credits at HE 6 at another University may APL up to 30 credits into the programme. A fee is applied for any external student bringing in credits from another Higher Education Institution. The University reserves the right to decide on the relevance to the final award of the credits being transferred in via APL. HOW WILL I LEARN? A range of teaching and learning strategies described below are used throughout the programme, to deepen your knowledge and apply this with an innovative approach to problem solving. Exploration of research enables the development of critical evaluation of the available evidence and application of this knowledge to your clinical practice. Where relevant, specialist professional frameworks and occupational standards will be incorporated as part of the individual developmental strategy. The Department of Health Knowledge and Skills Framework (KSF) will provide guidance in the learning and achievement process. Lectures allow information to be presented in a logical manner providing an overview of new material and stimulating you to read further around the subject and participate in discussions to develop knowledge further in small group sessions. Small group activities include seminars, debate, role-play, enquiry based learning and reflection sessions and they encourage the application of theory to practice, extending the depth and breadth of knowledge. Team working, time management, problem solving, communication, presentation and reasoning skills are learnt as a result of these activities. Simulation enables you to practice skills in a safe environment, apply theory and develop your dexterity. You can observe activities to learn from skilled and experienced practitioners then participate in care to develop skills whilst gaining feedback from experienced practitioners. 5 During self-directed time a range of activities is available to support your learning, including workbooks, videos and e-learning (including Moodle). This enables you to study at your own pace and in different areas. E-Learning: This is used as a learning strategy for many of the modules. You will use Moodle (our Virtual Learning Environment) for interactive activities that augment classroom teaching. Specialist Route modules for the Leadership and Managing Change Route are fully online modules. Moodle: Interactive Moodle activities will augment the classroom teaching through discussion forums quizzes etc. and will also be used for feedback and assessment. Supervision sessions complement all these activities by providing you with an academic who monitors your individual progress and offers guidance and support. You will also receive pastoral support from a Personal Tutor - you be notified of who this is when you commence the programme. WHAT TYPES OF ASSESSMENT AND FEEDBACK CAN I EXPECT? 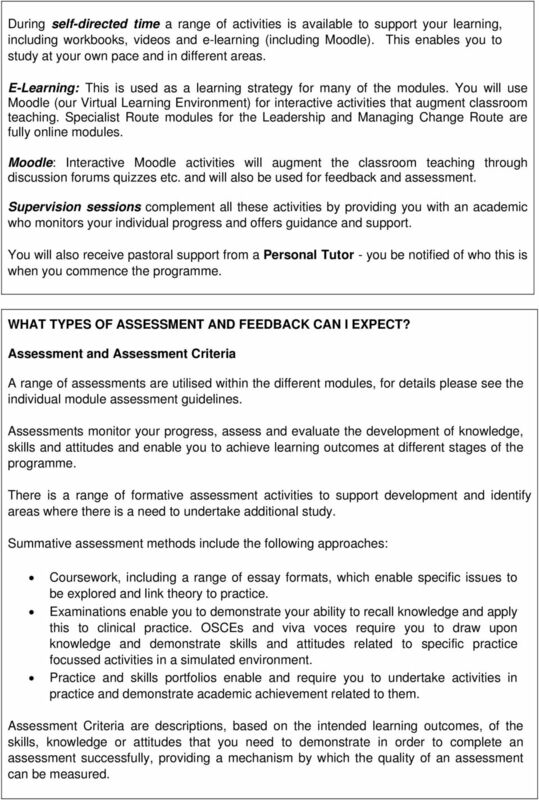 Assessment and Assessment Criteria A range of assessments are utilised within the different modules, for details please see the individual module assessment guidelines. Assessments monitor your progress, assess and evaluate the development of knowledge, skills and attitudes and enable you to achieve learning outcomes at different stages of the programme. There is a range of formative assessment activities to support development and identify areas where there is a need to undertake additional study. Summative assessment methods include the following approaches: Coursework, including a range of essay formats, which enable specific issues to be explored and link theory to practice. Examinations enable you to demonstrate your ability to recall knowledge and apply this to clinical practice. OSCEs and viva voces require you to draw upon knowledge and demonstrate skills and attitudes related to specific practice focussed activities in a simulated environment. Practice and skills portfolios enable and require you to undertake activities in practice and demonstrate academic achievement related to them. Assessment Criteria are descriptions, based on the intended learning outcomes, of the skills, knowledge or attitudes that you need to demonstrate in order to complete an assessment successfully, providing a mechanism by which the quality of an assessment can be measured. 7 WHAT WILL I STUDY? The programme consists of taught modules resulting in the accumulation of 90 credits and EITHER a Literature Review Project OR a Reflective and Critical Practice Project worth 30 credits. The taught modules consist of core, core specialist and elective modules. These modules may be studied in any order which suits you - unless there are pre-requisites. All taught modules are pre-requisites of the project i.e. they must be completed successfully before you will be allowed to continue with the Literature Review Project or the Reflective and Clinical Practice Project. 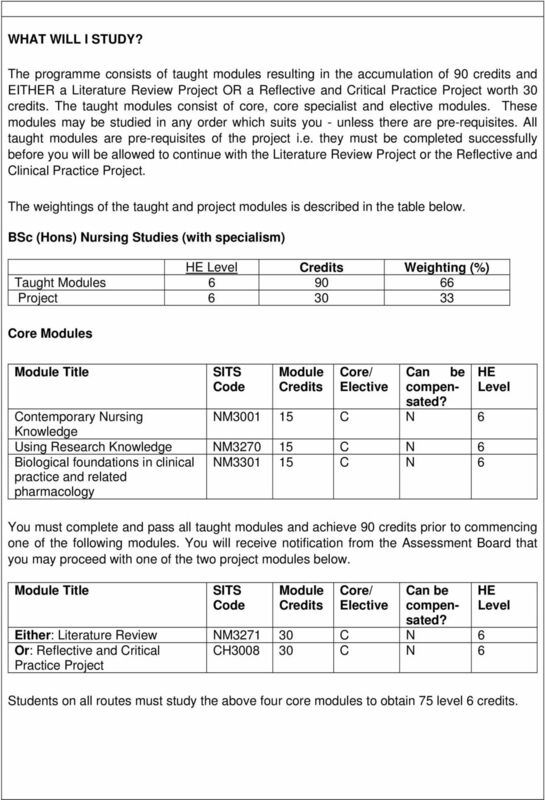 The weightings of the taught and project modules is described in the table below. 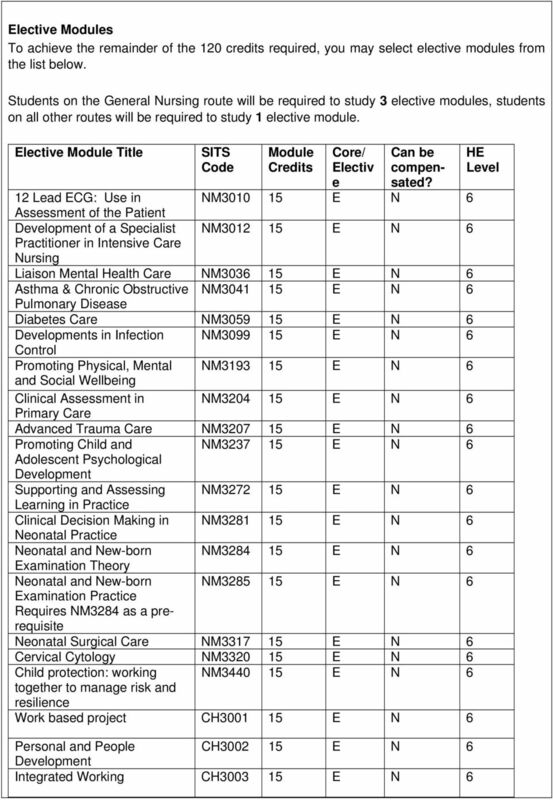 BSc (Hons) Nursing Studies (with specialism) HE Credits Weighting (%) Taught Modules Project Core Modules Code Credits Elective compen- sated? 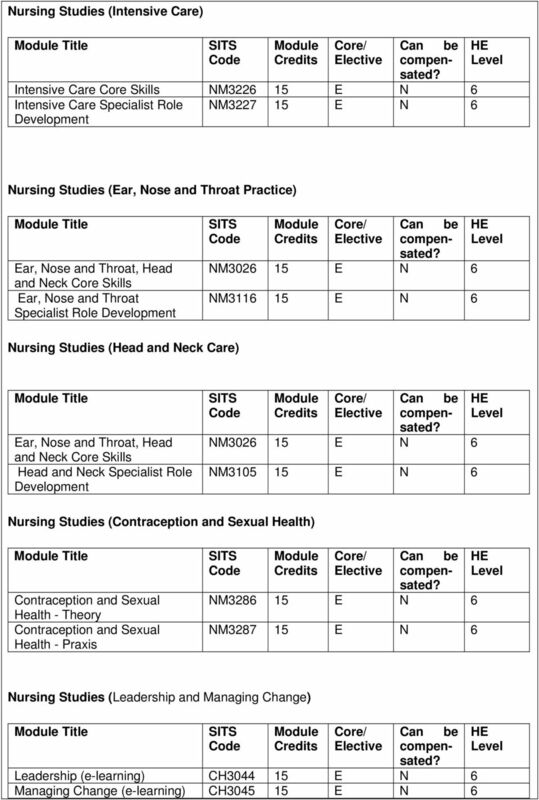 Contemporary Nursing NM C N 6 Knowledge Using Research Knowledge NM C N 6 Biological foundations in clinical practice and related pharmacology NM C N 6 You must complete and pass all taught modules and achieve 90 credits prior to commencing one of the following modules. 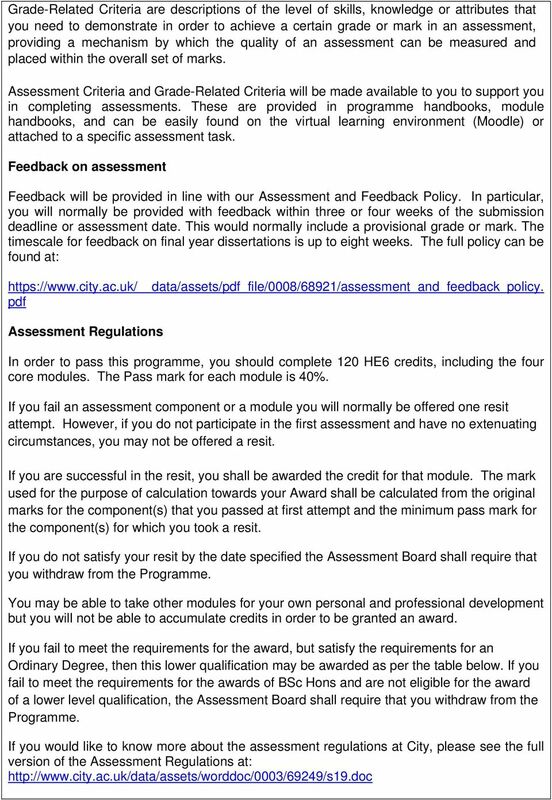 You will receive notification from the Assessment Board that you may proceed with one of the two project modules below. SITS Code Module Credits Core/ Elective Can be compensated? Either: Literature Review NM C N 6 Or: Reflective and Critical CH C N 6 Practice Project HE Students on all routes must study the above four core modules to obtain 75 level 6 credits.